The MG 151/20 cannon was produced by Waffenfabrik Mauser and used widely on Luftwaffe fighters and bombers during World War II. It was also used on Italian fighters such as the Macchi C.205, the Fiat G.55 and Reggiane Re 2005 and the Japanese Kawasaki Ki-46 “Tony.” Production began in 1940 as the MG 151/15 and in in 1942 was developed to take a 20 mm cartridge. The MG 151/20 was the main armament of the Bf 109F-2 and onwards. The rate of fire was 750 RPM with a muzzle velocity was 2,300 feet per second. The 151/20 averaged 25 hits to bring down a Boeing B-17 Flying Fortress and only 4 hits were required to bring down a single engine fighter. 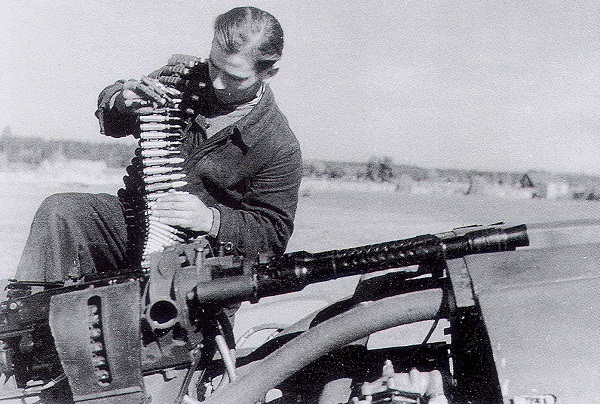 The 20 mm shell was developed from the original 15 mm cartridge by expanding the neck of the cartridge and shortening the length. This change required only changes in the gun barrel and other small modifications.